Posted on April 8, 2015	by Katy K.
There are years when I feel entirely unexcited about the Newbery and Caldecott awards… and then there was this year, when I looked up all the winners and honor books and got everything into my hands as quickly as I could. I’d already read El Deafo, one of the two Newbery Honor books, and both of the two remaining books were already on my want to read list because of the love from around the KidLitosphere. Both of these may be said to contain the dreaded Death by Newbery I loved them both and was thrilled to see the Newbery committee paying attention to #WeNeedDiverseBooks. Because we do. 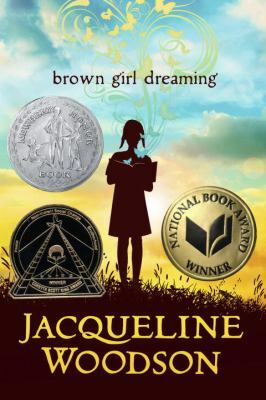 Brown Girl Dreaming by Jacqueline Woodson. Nancy Paulsen Books, 2014. This book has been showered with book awards – it won the National Book Award, the Coretta Scott King author award, and (closest to my heart if not media attention) was a Cybils poetry finalist, in addition to the aforementioned Newbery Honor. So… does this autobiography in verse live up to the hype? I myself was not disappointed. In short poems, usually just a page or two long, Woodson tells the story of her growing up, from her birth in Ohio, to living with grandparents down South, followed by a move to New York. There’s rich family history on both sides, as well as her relationships with her siblings and her friendships, the music they listened to and the Civil Rights activities that surrounded them. The poetry made me want to read it out loud – I often did, though reading aloud over breakfast carries the risk of kids being late to school as I’m not finishing my breakfast or packing their lunches. A poem describing Woodson’s grandmother’s garden in lush language – the colors, the curves, the scents – all destined to be side dishes – made the kids laugh out loud. Woodson tells how her sister would curl up under the dining room table with a book, oblivious to the world. Woodson herself struggled with reading even as she loved stories, another poem I had to read aloud to my dyslexic boy. The mix of universal and particular is seductive, and I found myself pushing to read just one more poem until I reached the end. I read about fifteen minutes to the boy when he went to bed too angry to sleep one night, and they worked beautifully to calm him down. This would be a great book for classroom read-alouds, as the individual poems are short enough to fill tiny schedule gaps and the language is beautiful to listen to. 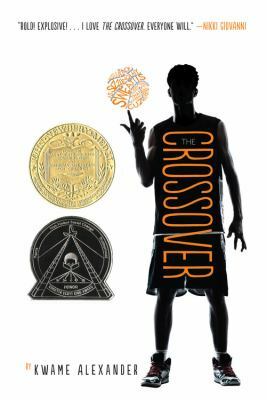 The Crossover by Kwame Alexander. Houghton Mifflin Harcourt, 2014. My blogging friend and fellow Cybils panelist Brandy over at Random Musings of a Bibliophile first brought this to my attention. Since her middle grade reading is largely fantasy, I pay extra attention when she’s as impressed by a realistic title as she was by this one. Realistic fiction about basketball, no less – not really a passion for either of us – which maybe paradoxically made me more excited to read it. Josh and Jordan are twins, and middle school basketball stars. Their father is a former professional player, while their mother, vice principal at their school, keeps them equally focused on academics. In poems that span a range of styles from rap to jazz or haiku and more, Josh (aka Filthy McNasty) tells the story of a momentous school year, the year that Jordan (aka JB) started ignoring him in favor of a girl, a very pulchritudinous girl. At the same time, he sees his father ignoring increases signs of health problems, still taking the boys out for donuts after practice. There is a lot of basketball, lovingly and energetically described. There’s also some really rich vocabulary – that “pulchritudinous” is straight from the text, and there are some meditations on “churlish” as well. But the real focus of the story is family, from Josh’s so believeable 13-year-old perspective,with looks at the relationships between all of the characters, from the two brothers’ newly strained relationship to that of the parents, overheard through bedroom walls. I read it straight through in one sitting and loved it. Except the sad part. But maybe, even if I’m tired of that kind of sad in middle grade and teen books, it wouldn’t have gotten the Newbery and therefore the attention it so richly deserves, without it. Here is a very short video of Alexander taking the #SpeedRead challenge with a selection from Crossover. If you’ve read either of these books, please let me know what you think! This entry was posted in Books and tagged #weNeedDiverseBooks, African-American, award winners, Coretta Scott King award, diversity, Newbery, poetry. Bookmark the permalink.